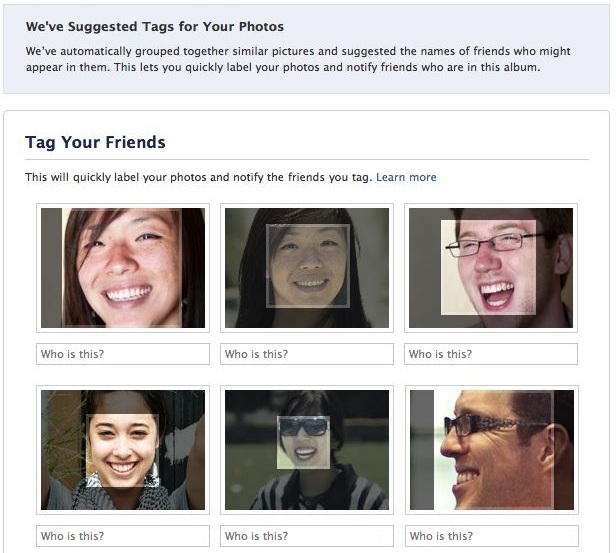 Good news everyone, face recognition and photo-tagging recommendations on Facebook are back! Facebook is making use of its Face.com acquisition once again and will reintroduce its photo-tagging suggestions, the social network announced in a blog post. The facial recognition feature, which landed in hot water over in Europe before Facebook relented and removed the tech to comply with European privacy regulations, was shelved in the United States for “technical improvements.” The reintroduction of Facebook’s facial recognition tech doesn’t mean it’s been met with open arms in the United States either. Lawmakers in Capitol Hill expressed their concerns for Facebook’s treasure trove of facial data as well. The photo-tagging suggestions feature is simple and efficient, and tagging your friends admittedly becomes a breeze. When you upload an image to Facebook and start tagging relevant friends, Facebook’s facial recognition tech is able to identify and suggest the names of the people it believes are captured in a photo. There’s even group tagging to ID one person in multiple photos. Facebook may even help take the guess work out of faces that you’re just not familiar with. Since Facebook doesn’t really make opting out obvious, we figured that we could point you in the right direction so you won’t show up as one of Facebook’s recommended tags when friends go to tag photos with you in it. Click the gear icon on the top right of your Facebook page. Click on Timeline and Tagging on the left hand navigation column. On the Timeline and Tagging page, in the category for “How can I manage tags people add and tagging suggestions?” you’ll be able to edit “Who sees tag suggestions when photos that look like you are uploaded?” and opt out by selecting from the default “Friends” drop down menu. If you don’t see the final step (step four) then the feature hasn’t been released to your Facebook profile yet.